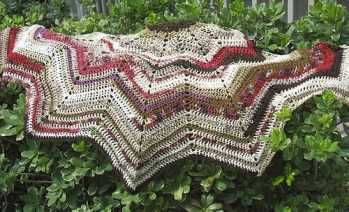 Crochet pattern instructions for a beautiful semi-circular ripple wave shawlette (seen here crocheted in NuMei Catena - color: Neapolitan). Shawlette uses 550 yards of sport-dk weight yarn and is crochet from top down so it can be adjusted to your desired length. Finished shawlette measures 48 " across and 23 " from top to point.